Dion graduated with a Doctor of Philosophy (Arts) in Cultural Studies from The University of Melbourne in 2012. Dion combines his full-time career as an editor with freelance arts writing. He has accumulated an extensive body of work as an essayist, columnist, reviewer, and host of the literary and culture podcast The Rereaders. 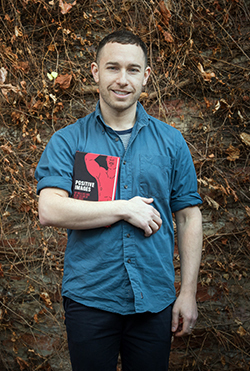 Dion's book Positive Images: Gay Men and the Culture of ‘Post-Crisis’, based on his PhD research, has recently been published. Dion's editing role at Black Inc. involves project-managing books through the publishing life cycle from commissioning to publication. While prose editing is the heart of his work, the varied role also includes preparing early sales and marketing copy, securing the cover design, sourcing endorsements, and of course, being the key liaison and support for authors. As Black Inc. is a publisher of quality works, Dion's background in academia positions him well to deal with publications of this calibre. He says that his 'academic chops' are very much valued in publishing. "With my academic background, I'm seen as an expert in certain areas and am well-placed to work with academics who are translating their research for other audiences." "I am really excited about a career in publishing and the way it dovetails with academia." Dion comments that all his writing is informed by his academic background. "I enjoy the benefits of being a professionalised thinker. I take this into the world of commentary and criticism." While his criticism draws strongly on skills deriving from cultural studies research, he admits to enjoying the more 'ad hoc and relaxed' nature of non-scholarly writing with its quicker outcomes. Dion's initial career intention was to work in academia and to this end he built a considerable CV in teaching, coordinating, and redesigning curriculum in gender and cultural studies during and following his PhD candidature. But he faced the oft cited challenges of establishing a full-time ongoing academic career. With the realisation that, "I've been a casual at various universities for over ten years and this could go on for another 10 years," Dion made the move into publishing. "In fact what I'm doing now is a better fit. While I loved teaching and collaboration with other scholars, I'm very much at home in a smaller organisation where everyone works together in a far less atomised way. And I'm really happy facilitating other peoples' writing and research." His advice to graduate research students is "to participate in cultural and professional worlds outside academia which connect to their research field." Dion engaged with a range of such worlds during his candidature - among others, he wrote as a freelance arts journalist, immersed himself in the new and emerging writers' scene, and edited for independent and graduate journals. He is an advocate for 'the engaged scholar, the organic intellectual' who participates in the broader world of their research field. It comes full circle too. "Not only do you get to test out your skills and interests beyond academia, but connecting to the broader community of your field enriches your research."